If you fancy yourself as something of an animal lover, love to travel, and have no fear, then why not venture to South Africa? There are many resorts that have some of the most endangered and fascinating rare species. Dare to take a closer look at some of the 299 species of mammals and 858 species of birds. You may already know about the Big Five – (Elephant, Buffalo, Lion, Leopard, and Rhino) but have a guide through the best places right here and discover some other species you may or may not have heard of. Visitors embark on a journey in ‘The Place of Water’ as the name suggests where they will find themselves surrounded by spectacular forests, and many of the beautiful birds that inhabit the area. Crystal clear waterfalls and a variety of swarming butterflies can be seen in the summer. Birdwatchers can scope the sights of species such as the Cape Parrot, which is rare but one of the friendliest you will come across. They love to see the visitors and love the attention and yet, they are so laid back. The main difference between the male and the female species is its narrow band of orange feathers on the forehead. The male only has them when they are young. Visitors can relax in the chalets, can catch a nice picnic spot in a shaded grove of trees, and can go on a guided trail and listen to the tale of British soldiers who settled there after the Anglo-Boer war. The D’Nyala Nature Reserve is home to many species, such as the white rhino, giraffe, zebra, and tseessbe (an African antelope). But visitors will want to watch out for the predators, like the leopard and the brown hyena jackal. Can a victim (like a wildebeest) out run a ruthless hyena? Not likely, especially in long distances. If the victim gets caught, it can take 10 minutes for a group of hyenas to feast and entirely devour an impala (a medium sized African antelope) and will do that while the impala is alive. They are known as the ‘cleaners of the Savannah’, however the hyena is no match for lions. Visitors are advised to view the wilderness in the situated chalets as it makes for great game-viewing such a sight to behold, the name D’Nyala comes from the most characteristic evergreen Nyala tree. This is a great reserve that not only includes self camping catering accommodation but also features many highlights like Angling, Picnicking and windsurfing. The reserve is also close to other destinations like the Kruger National Park, and tourist attractions of Botswana, Zimbabwe and Mozambique. Along with the big five, visitors can also find 400 different species of birds including water birds and these are a main attraction. The spectacle of all these surrounding the dam is absolutely fascinating. Check out the roan antelope, they are fearless, even against lions. They will use their scimitar shaped horns to fend their predators off. This part of Africa has one of the world’s most renowned safari parks. Covering a total area of 22,270 square km, the Etosha National Park is home to 114 mammals, 340 birds, 110 reptiles, 16 amphibians, and surprisingly one species of fish, so visitors will want to check out the unusual fish. The name ‘Etosha’ means ‘Great White Palace’ and it became one of the first places designed for holidays in Namibia. The lodge accommodations are so vast and beautifully designed on both the Eastern and Western sides that you would think that you just became royalty overnight when the hosts pamper you and take care of your every need. You have no need to lift one finger. However visitors should be wary of the opening and closing times of the park, afterwards visitors can stay in their camps and enjoy the excellent night game viewing, or be up close and personal sleeping in their cars outside the park, and bearing mind the sharp-toothed prowlers and the bushes that rustle at night I know which one I’d pick. Best times to visit are between May to September which are the cooler months in Namibia. 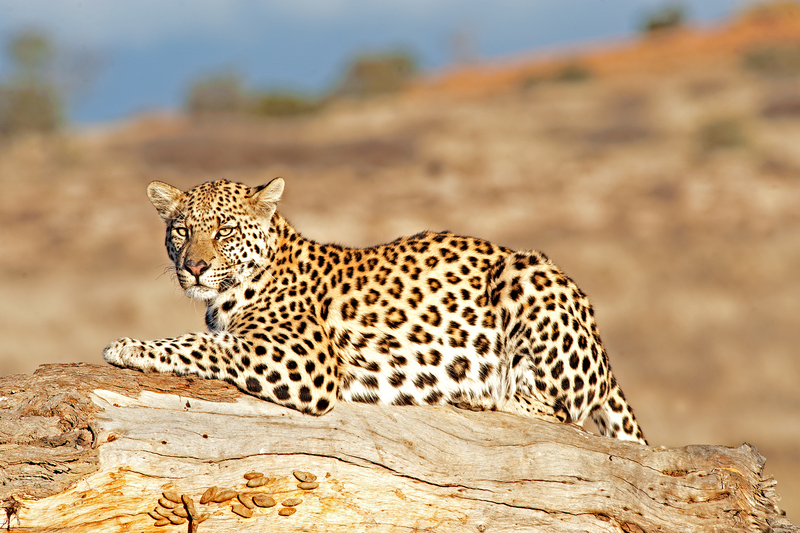 Those who seek the ultimate safari experience, look no further than the Kruger National Park. Nearly 2 million hectares of land that stretches for 352 kilometres, the game reserve is the largest in South Africa and is larger than Israel. Not only will visitors encounter the Big Five, but they will also see the Little Five (buffalo weaver, elephant shrew, leopard tortoise, ant lion and rhino beetle) and also the ‘Big Six Birds’ (ground hornbill, kori bustard, lappet-faced vulture, martial eagle, pel’s fishing owl and saddle-bill stork). Because of its vast area, the game reserve is split into four regions. The Central region will draw the most tourists due to the 60 prides of lion that inhabit that area. If rare sightings of birdlife is more your choice, head up to the far north region. Check out the rare Sharpe’s grysbok, these are timid creatures, and will disappear quickly if they see anything that they consider unusual. Expect to see up to 9000 elephants in the northern region and be sure of seeing a white rhino in the Southern region. These are just some of the wildlife resort that make South Africa so exhilarating and opens visitor’s eyes to the animal kingdom. It is definitely worth looking into as opportunities like this do not come often and especially as places like this are not visited often enough.